The global pain management therapeutics market is extremely fragmented with both large and small players in high numbers. The degree of competition is high, but is not expected to deter new players from entering into the market on account of the high growth potential of the global pain management therapeutics market, states Transparency Market Research (TMR) in its new report based on this market. The report further states that regional players are intensifying the competition level by manufacturing a large volume of pain management drugs and at cheaper costs as compared to well-established and well-known manufacturers. Nevertheless, the well-established players are expected to hold their leading positions on account of the brand value they have achieved over years of hard work and efforts. Names of prominent players within the market include: Mallinckrodt plc, Abbott Laboratories, Endo Health Solutions, AstraZeneca plc, Eli Lilly & Company, GlaxoSmithKline plc, Johnson & Johnson, Novartis AG, Merck & Co. Inc., Purdue Pharma LP, Pfizer Inc., and Teva Pharmaceuticals. According to Transparency Market Research, the global opportunity within the pain management therapeutics market will be cross US488, 253.4 mn by the end of 2025. On the basis of disease indication, it is predicted that the cancer pain management segment will lead throughout the forecast period. On the basis of type of therapeutics, the market for opioids and NSAIDS will flourish. Geographically, North America, followed by Europe is leading in the market for pain management therapeutics. As per the lead author of this report, “The market for pain management therapeutics is anticipated to grow, fuelled majorly by factors such as growing geriatric population, changing lifestyles, rising number of surgeries, and an alarming rise in the incidences of chronic diseases.” The statistics from the National Health Interview Survey has stated that around 20% of the total world’s population had been suffering from chronic pain, as surveyed in 2016. The launching of newer drugs and reformulation of those which are existing are ensuring that the global pain management therapeutics market continues to advance. The improvement in the healthcare infrastructure in developing nations as well as the rising penetration of major players within the pain management therapeutics market in the developing nations have considerably helped the market to flourish overall. Reaching out to the developing nations and tapping on the unmet medical needs of the patient population is proving to be one of the most profitable decisions working well for both manufacturers as well as patient pool. 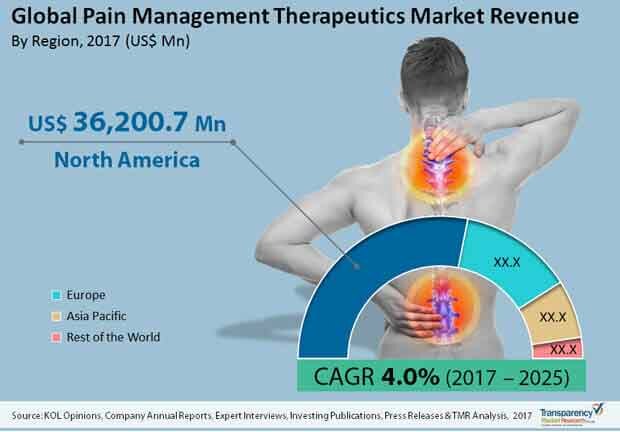 The role of extensive research and development carried out by leading manufacturers of drugs, backed by advancements in technology and biotechnology and pharmaceutical sectors is also key for the growth of the global pain management therapeutics market. On the other hand, stringent regulations opposing the use of opioids in certain countries as well as the extensive time taken by newly launched pain management drugs to fully penetrate into the market are anticipated to pose as challenges and restrict the growth of the market.